Editor’s Note: This post was written by Seniors David Hoyt and Leslie Martin. Neither of them are ready for graduation. 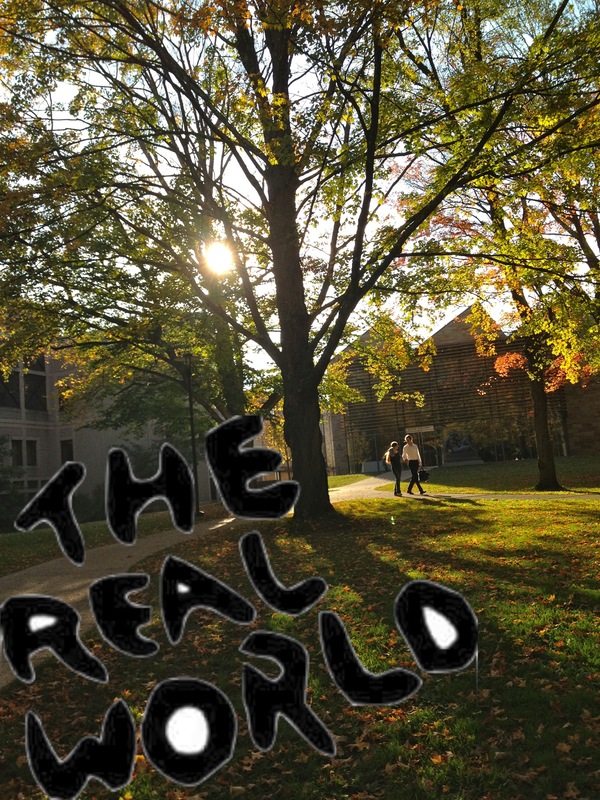 Photo art by Leslie Martin ’14. Over the summer the class of 2014 received a purple postcard in the mail advertising something called “Taste of the Real World: A Dinner & Lecture Series for Kenyon Seniors.” As the card explains, this is “a program designed to prepare Kenyon senior class students for success after college.” Let’s pause there for a second. Didn’t we go to college thinking it would prepare us to be successful after college? Did we miss the memo that this was an optional feature, like floor mats in a new car, and not part of the standard package? While it’s disturbing that Kenyon seems to think they haven’t actually taught us to survive on our own, on the other hand, maybe they’re going a little overboard. Maybe we haven’t been formally taught anything of value, but we still can’t be that helpless. We were beginning to panic when we realized that our courses in the Theory of Comedy and the Habsburg Empire weren’t actually sufficient to navigate the big scary world out there, but then we looked at the actual list of sessions and realized that Kenyon actually has taught us all we need to know — just in less formal ways.